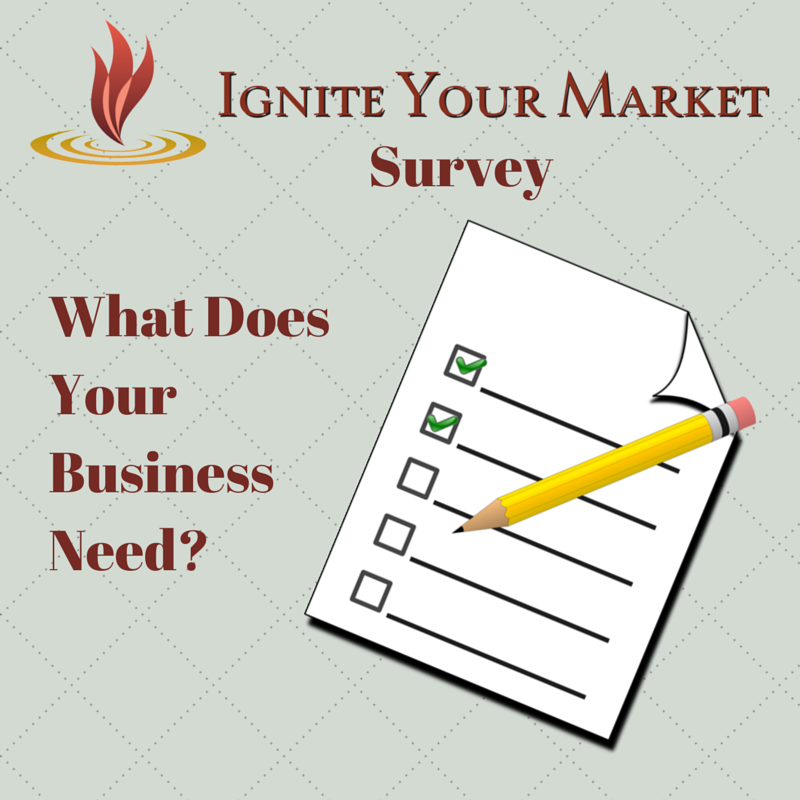 Ignite Your Market Survey: What Does Your Business Need? There is nothing like a survey to understand what is important to your target market. The input is invaluable in designing content for blogs, podcasts, and presentations and developing new products and services. I recommend conducting a survey of your market at least once or twice a year. So, following my own advice, I am requesting YOUR feedback so that I can create content that services your needs. 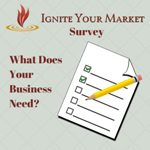 Please take just 5 minutes and respond to my Ignite Your Market Survey: What Does Your Business Need? below. As a thank you for participating, once the survey is closed I will send you a copy of my brand new Ignite Your Market Business Health Check Up Questionnaire. Remember to enter in your name and email address to receive this gift. The survey will close on February 16th, 2015 – so please do it now while it’s top of mind. I truly appreciate your support. Thank you for being part of my community. Note: I respect your privacy and your contact information will only be used to communicate with you and it will not be shared in anyway. Thanks for the questionnaire which served as a self analysis. What a reality check!! Completed! 🙂 Good questions, made me realize what I was lacking. Completed my survey. Great questions and a great reminder of the importance of touching bases with your dream customer. Too often business owners create and develop before asking what is needed. Kudos! Got the survey done, Heather. Surveys are a great way to learn how you can best serve your audience. Great post! For me, I feel that my clarity and drive are there, but I am a creative person, who often runs into issues when it comes to technicalities. And with an online business, tech stuff is just essential to have all your business tools in place. Thanks for taking the time to figure out what your followers need. Renee – thanks for you input. I’m learning that is a sweet spot for me as I love the techie stuff and have the creative side too. I agree that surveys are a great tool. I took your survey (and was brutally honest with myself! Yikes! Heheeh). Looks like you are working on great stuff! A. Lynn – thanks for being brutally honest taking the survey, that type of input is going to be priceless. Great idea to survey readers. Questions were well thought out. It made me stop and think what do I really need. Roslyn – thank you, I’m glad it make you stop and think. I’m getting great answer and looking forward to review them all and providing better content to my audience. Thanks for the survey opportunity and I look forward to hearing any tips you can offer, once you read it. I love quizzes and surveys myself and see how this is a great way to get to know who needs and wants what. Thanks for sharing and for the offer that goes with it. Beverley – thanks for answering the survey. I’m getting some great replies and see some interesting trends. Looking forward to sharing the information. Love the look of your blog! Fantastic idea to find out what your readers need and want by utilizing a survey 🙂 Thanks for sharing 🙂 Will have to implement as well!! Joan. Survey are a great way to see what reads are thinking and I love Google Form as a tool. Give it a try.